It was during this time that I began to learn more about computers and I bought my first one, a Timex Sinclair. It didn’t take long to outgrow that little box and I made my first big investment in an Epson QX-10. It was one of the first CP-M computers with a user friendly interface. 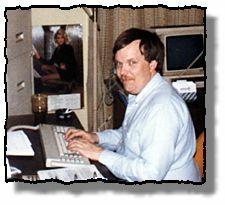 I became active in the Epson User Group and taught myself to program in Basic and dBase II. When the University bought a MS-DOS based Zenith computer for my department, I quickly jumped on the opportunity to design database applications to track work flow, economic projections, and created a data base of the University slide collection. I continued to work at the Media Resource Center for nine years where I further developed my management skills and learned the finer points of multi-media slide presentations. I also continued to pursue my education and received my Master of Arts degree in Communication in 1985. In 1987, I met the second woman to leave a significant lasting impression in my life. The relationship was short, but it WAS intense. Our first date was during the Christmas break and within a few short months we had moved in together. I felt very comfortable in the relationship and really thought I might marry Cathy. But below the surface of this domestic bliss was a volcano awaiting eruption. On the positive side, Cathy had instilled in me a new confidence to succeed and in May 1988 I quite my job at the University to go after my entrepreneurial dreams of a self-employed photographer and audio visual producer. I had over the past years built a fairly stable freelance photography business shooting weddings, events, and editorial assignments. Along with my newly learned skills of computer programming, I had an idea of forming a new company called “B&B Enterprises” merging photographic and computer technologies into something both Cathy and I could work together. But, that was not to be. Within two months my life was to take a dramatic turn. As my relationship with Cathy began to deteriorate I didn’t understand what was going on and I worked hard to save it. I was desperate for answers and turned to a place I had long ago forsaken. Cathy was spending most of her time now away from home as she pursued her dreams of the stage so I began attending some singles group meetings in the evenings at a couple of churches. I also began going to church on Sunday morning where God began working on my heart. I know now that God was preparing me for this fall. In a short time I was to experience the gut wrenching pain of betrayal, deceit, and a broken heart as my relationship with Cathy ended one July night about as fast as it began. After Cathy walked out, I felt abandoned and lonely and cried out to God for help. And He heard me. I was to learn firsthand what it means to experience a peace that transcends understanding (Php 4:4-7). Within a short time I was to find myself in the office of Pastor Joe Wright at Central Christian Church pouring out my heart to him. I wanted answers but he told me that I already knew what needed to be done. And I did.